I stumbled upon a very interesting article by Noora Kotilainen, research assistant at the Finnish Institute of International Affairs (FIIA) in the latest issue of the Finnish Journal of Foreign Affairs. Since her excellent piece has not been translated into English to my knowledge, I thought I would give you a brief summary of her argument on the importance and changing nature of imagery and photography in today’s conflicts. She starts with the premise that war photography, or the visualization of suffering in conflict has always been a powerful means of mobilizing public opinion and action against violence. It is most successfully used in humanitarian crises or conflicts, where images of suffering people prompt us to take action, either in the form of donations or political pressure to intervene. Despite the ubiquity of violence in entertainment and through other fictitious channels, however, war photography and the visual representation of western-led wars in particular has changed dramatically. She notes that in Afghanistan, Iraq and the ‘war on terror’ the imagery has become remarkably sterile, particularly when representing the suffering of US soldiers. She quotes a 2008 study by the New York Times which pointed out the rarity of images that portray wounded or dead soldiers on the coalition side. Self-censorship in the name of ‘good taste,’ she notes, is at the heart of this transformation, but it is also a deliberate strategy by militaries and governments to steer and control the way in which war is portrayed in the public realm. While this may not be surprising – indeed such imagery was very costly in political terms in the Vietnam War, for example – she points out that the style of war photography has also changed over the years. 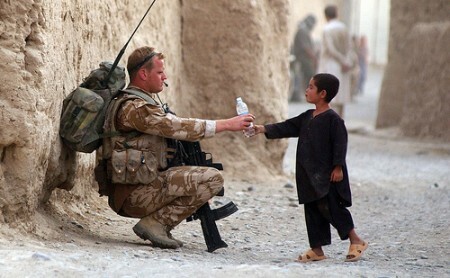 Indeed a ‘humanitarian-warrior’ image is replacing more raw, realistic representations of conflict and is becoming a staple of ISAF‘s public relations strategy in Afghanistan. To maintain support for an already unpopular war the image portrayed has to be as positive as possible, feeding into the narrative that the war against terrorism is at its core a humanitarian one. She concludes that such visual propaganda makes opposition to war that much more difficult to mobilize. What do you think? Is the visual landscape of today’s conflicts being manufactured to hide war’s true true nature or has such propaganda outlived its usefulness in an age of citizen journalism and the internet?